Growing up as the son of a drummer in a Bagpipe band and in a home where older Celtic songs were the everyday sounds, Jeff developed a love for the music of Scotland, England and Ireland. His concerts have been described as "quiet and relaxing " and much of it is, but sometimes he'll break out and the foot stomping begins. The magical sounds from the instruments coupled with vocals and Jeff's love and knowledge of his Scottish heritage create a delightful program of traditional and original tunes and songs. Much of the history of Scotland, England and Ireland is preserved in song. Hearing those stories along with the songs educate as well as entertain.You will see singing, laughing, lots of smiles and perhaps a few tears. There is no better example of this than the Ballad of Kilkelly Ireland. In 1855 John Hunt left his family's home in Kilkelly Ireland and came to the United States. When he left Ireland, John Hunt was 13 years old. He settled in Maryland, found a job, got married and had children. He never returmed to Ireland and never saw his family again. Without cell phones and the internet, communication was by the annual family letter. In the 1970's these letters were discovered by songwriter Peter Jones. He wrote the ballad that tells the story of the Hunt family. 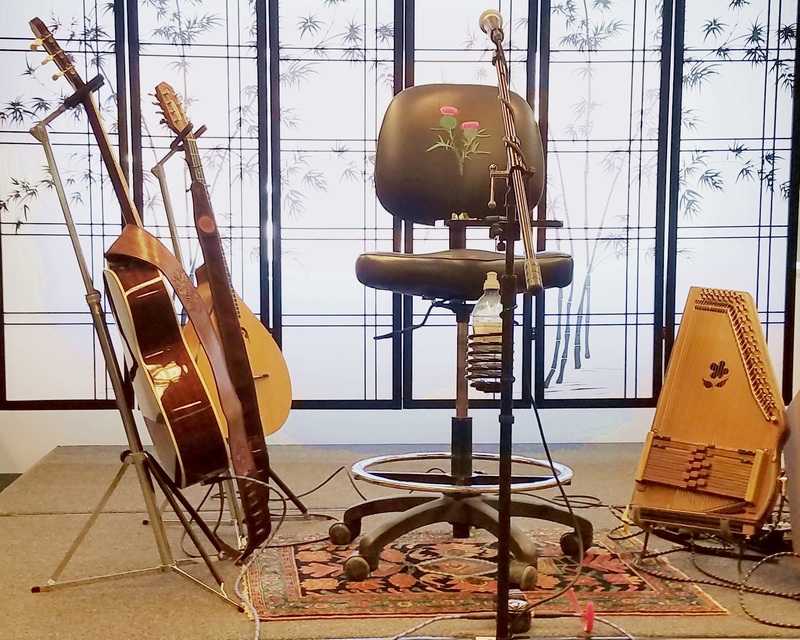 A typical concert includes a guitar, bouzouki and the autoharp and is an event the audience will talk about for a long time. Are you looking for Acoustic music for a wedding or other event? Jeff can supply that either as a solo performer or in combination with other musicians. He has a network of singers and musicians for just about any interest and style to provide the right music for your event. "We have just had several Celtic musical programs at the Plymouth Public Library and I wanted to let people know that if you are looking for a great music program, Jeff Snow was a huge success. He had the audience singing, laughing and truly engaged while he performed beautiful music on several instruments..... I will be bringing him back next year!" "If your library is looking for an addition to your music or history series Jeff would be a great choice, we were delighted." "Jeff gave a 5 star performance. I can't recommend him enough. He is a very talented musician and an engaging storyteller who held the audience in the palm of his hand. This concert was one of my favorites, we will definitely have him return." Richard Sugden Library Spencer Ma. "Jeff Snow brings the rich tradition of classic celtic music to life. His vibrant arrangements of the classics blend perfectly with his original Celtic compostions." Joseph Carvalho III Retired President, Springfield Museums Springfield Ma. "Your Performance made this year's event even more festive, and we hope that you will consider returning in future years." "Tower Hill Botanic Garden" Boylston Ma. A February 2018 interview broadcast on QATV Quincy Massachusetts.